Quinoa gets the sweet treatment in this refreshing summer salad with strawberries, blueberries, and red currants (though you can easily sub raspberries or blackberries in for the currants). 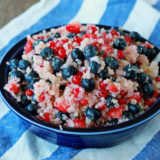 Quinoa has an almost neutral flavor, so it just soaks up all the deliciousness of the easy honey-lime dressing, which complements the bright bursts of berries perfectly in this Red, White & Blue Quinoa Fruit Salad. I went with blueberries, strawberries, and red currants, but just about any fresh fruit combo will do wonderfully. “Ain’t nobody got time for this,” I thought, as I painstakingly picked minuscule currant after currant from tiny dangling stems and plopped them, two by two, into a bowl. I’m normally not one to include “ain’t” in my lexicon. In this case, though, it fit. My wonderful CSA farmer snipped a glorious bunch of berry-laden stems and sneaked them in with my loot last Friday, and I needed to do something with them quick. No way were they going to waste. I returned to my plucking, and suddenly, it hit me. 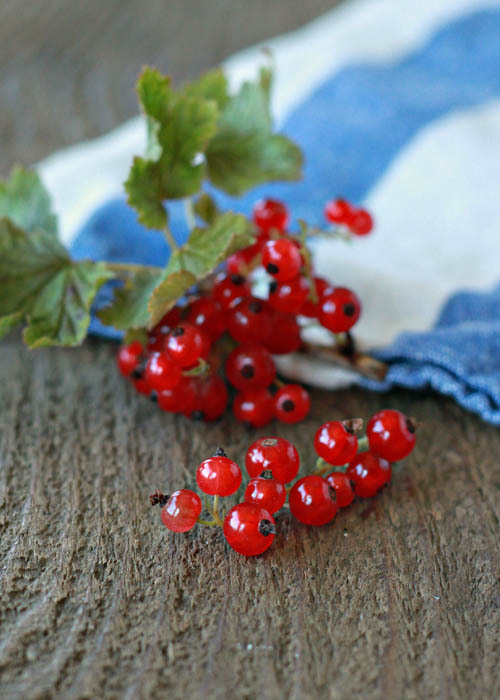 To have time to remove red currants from their precocious stems – it’s a gift. I thought about how fortunate I have been to be able to hit the brakes for awhile, step away from corporate life, and hang at home with my little one for this precious period of time. I thought about how, with both of my hands fussing over these tiny berries, I didn’t have the option of using this rare bit of downtime to fiddle with my iPhone or iPad or iWhatever, and I thought about how this gives my brain a little more room to think deeper thoughts. And I thought about how, sometimes, you just have to make the time to do stuff you don’t have time for, because really that’s the most important time of all. And then after all my Deep Thoughts, I made a fruit salad. But just not any fruit salad – a quinoa fruit salad. 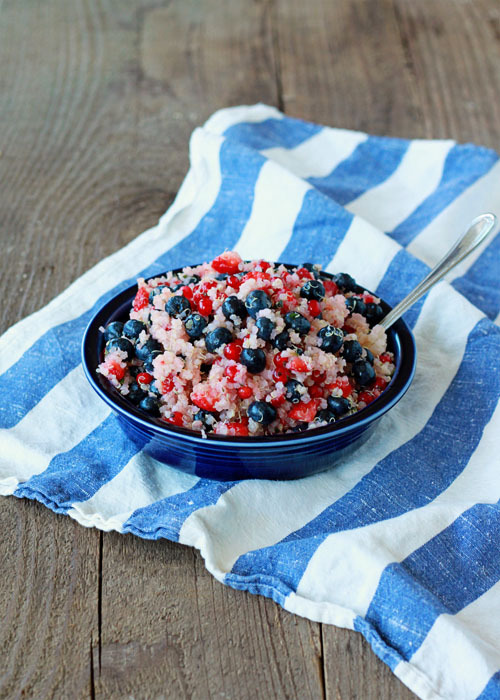 A red, white, and blue quinoa salad, to be exact. I’ve been crushing on Maria’s Quinoa Fruit Salad with Honey Lime Dressing since last summer. Well, I’ve been crushing on the idea. Honestly, at first, I wasn’t sure I’d like a sweet salad made with quinoa – I’m so used to associating quinoa with savory dishes. But I kept thinking about it. And you know, quinoa really does, as it turns out, lend itself perfectly to a sweeter treatment. Quinoa has an almost neutral flavor, so it just soaks up all the deliciousness of the easy honey-lime dressing, which complements the bright bursts of berries perfectly. I went with blueberries, strawberries, and red currants, but just about any combo of fresh fruit will do wonderfully. 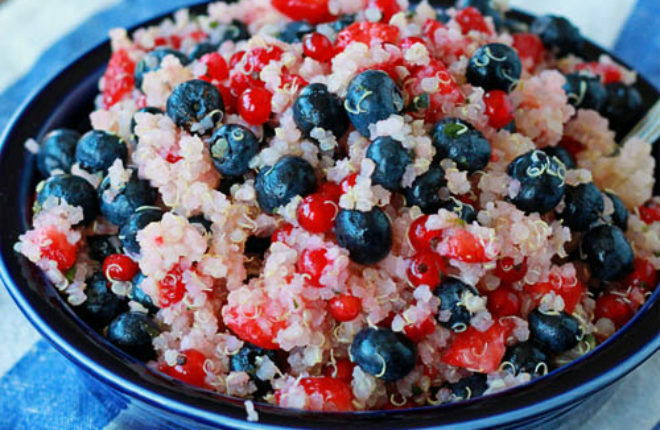 Quinoa and berries together – what a seriously nutrient-packed dish. Plus, it’s satisfying and scrumptious. Totally worth the time it takes to put together – which, really, is hardly any time at all. Make the dressing. In a small bowl, whisk together the lime zest, lime juice, honey, and peppermint. Set aside. 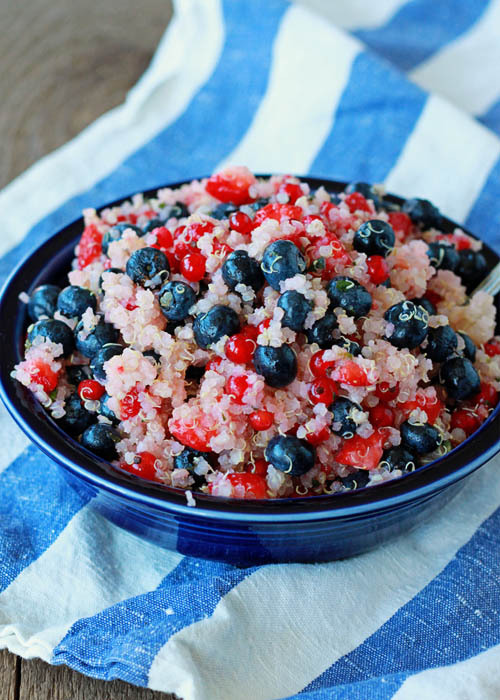 Place the quinoa, blueberries, strawberries, and red currants in a large bowl. Pour the dressing over the top and toss gently. Serve. Keep refrigerated in an airtight container for up to two days, but I think it’s better when served right after assembling. Swap out the honey and use agave syrup or pure maple syrup instead. If you use maple syrup, I recommend Grade A, which has less of a distinct maple flavor. *For more on how to cook quinoa, this tutorial over at The Kitchn is very helpful. What a gorgeous salad! It sounds very tasty. I like the idea of a patriotic salad!